We caught the 2pm red bus out of Stehekin, along with several older passengers who convinced the driver to do a combination tour bus/shuttle ride. After the normal stop at the bakery we also made a stop at Rainbow Falls, and one at the confluence of Agnes & Stehekin Creeks. With all of this on & off, we ended up chatting with 4 geezers (by their description) from Olympia who were headed to the ranch for dinner with a bottle of red in hand. It turns out they are all backpackers, and one is even a PCT thru-hiker (Bug, NOBO 2010). We said good-bye to them at the High Bridge ranger station and made final pack adjustments before heading for the trail somewhat after 3pm on a hot, sunny afternoon. Fortunately the trail was more or less shaded as we made a steady but gradual climb along the Agnes, whose churning aquamarine waters rumbled steadily far below. Our progress was slowed significantly by the bounty of ripe blueberries at this low elevation, as we were unable to pass by without enjoying frequent handfuls. We eventually climbed too high for ripe fruit, and picked up the pace to get some decent mileage in for the afternoon. We both felt good after our replenishing morning in Stehekin, and when we reached Swamp camp just before 6pm we decided to push on a little further to reach the slightly higher elevation (and much more appealing) Cedar camp. We were surprised to find 4 tents there, as we hadn't seen any hikers since leaving High Bridge. It turns out they were all thru-hikers, including a group of 4 from France that we had seen briefly on the trail at Brush Creek a few days back, and a solo guy Michael. We stopped in to say hi, then found a free spot on the ridge above them and set up camp. After dinner we talked a bit with Michael, who is a professional photographer from Alaska by way of New Mexico, and it turns out that I had read his blog the week before we left for our own journey, so he seemed a bit familiar even though this was our first meeting. 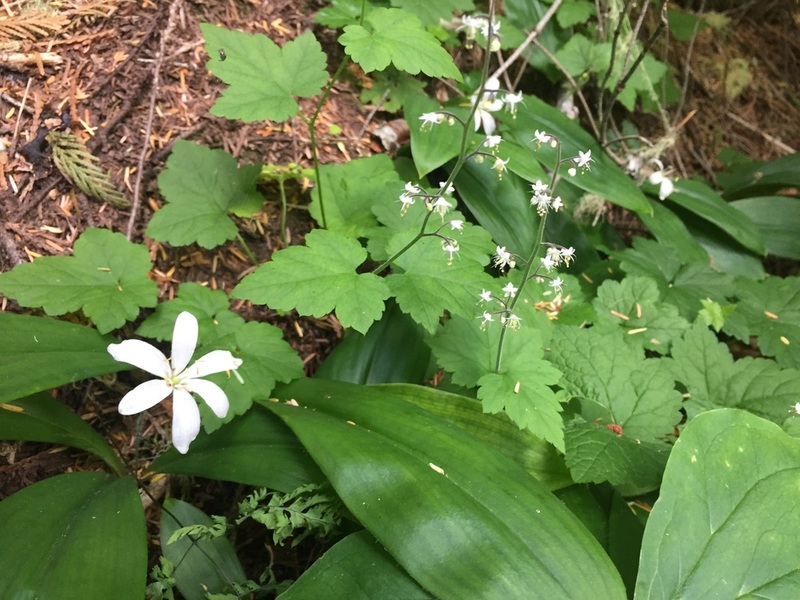 Day 10 started out cool and cloudy as we walked through a forest of cedar and fir, noting that all of the plants had low habitats and white flowers in this shady ecosystem. For the first few hours we leapfrogged frequently with our camp mates from the night before, as we all had different timing for rest breaks but similar hiking speeds. We forded the Agnes at a shallow spot south of Hemlock camp, then continued our steady climb and ultimately spread out as the French group took much more frequent breaks. Although the trail had been almost completely cleared of blowdown from Stehekin to Hemlock camp (kudos to the saw teams! ), much of the lower elevation trail was still overgrown by vegetation that came up to our waist or higher. While we were happy it wasn't wet, it is still hard work to push through the plants, try to watch your footing, and avoid getting caught on the brambles. The temperature dropped and the clouds turned into wet mist by late morning, so we minimized our stops to avoid getting chilled. We came across 3 older backpackers from Olympia heading from the Suiattle River to Stehekin and in our very brief conversation found out they know the guys we met on the shuttle bus yesterday. What a coincidence! We finally broke out of the forest at the base of Sitting Bull, a dramatic rock face that sits above a sweet little alpine basin filled with burbling brooks, wildflowers, piles of rock, and a few small snow fields. The mist swirled around adjacent peaks but there was a patch of blue sky over Sitting Bull, and we dawdled across the basin taking several pictures in the rapidly changing light. We climbed over the shoulder of Sitting Bull and made a long ascending traverse to Plummer Basin, a rocky bowl with several large snowfields and a few curious marmots. We passed Michael there for the last time and continued to climb the next 3 miles to Suiattle Pass. The weather remained damp and chilly and we had no more blue sky, though the clouds stayed high enough that we kept some views of our immediate surroundings. The wildflowers, trees, rock, and numerous streams kept the day interesting. On the long forested descent to our campsite at Miners Creek we finally caught up to Liam, a guy we'd seen ahead of us earlier in the day. We set up camp in the mid-afternoon and Liam stopped in for a long chat before continuing on for a few more miles. He's originally from Scotland but has lived in Australia for years. Andrew got caught up on politics from down under and we heard briefly of some exotic hikes he's taken (Iraq! among others). He saw a piece on the PCT in National Geographic many years ago and it planted a seed. When his Australian citizenship recently came through, leaving him more free to travel abroad, he quit his job to come check it out. The French quartet showed up in the early evening and camped across the trail, so we took the opportunity to hang out while we all ate dinner around their small, smoldering campfire. They are all young professionals with Leo as the ringleader. He studied in Berkeley for a year and joined some friends on a backpacking trip in OR near the PCT. He learned about the trail and caught the bug. Over dinner in early January he convinced the others to join him, they all bought plane tickets to Seattle 3 days later, then moved in together to save on expenses and ultimately quit their jobs to have this experience. Pierre, who left the most highly-paid position of the 4, was concerned about what his father (who is "very close to money") would think, and was happily surprised that the reaction was one of pride. I love hearing people's stories about how they learned of the PCT, what motivated them to take a thru-hike, and what life decisions and sacrifices they have made to get them to the trail. Fun Fact: We've heard many pronunciations for Suiattle, but local consensus seems to be for SUH-WADDLE. A close runner-up is SWEE-ATTLE. Are you from around here? Let us know in the comments section how you pronounce it. We had overnight rain and Day 11 started with thick mist. We waved goodbye to our French friends as we hit the trail in several layers of clothes. 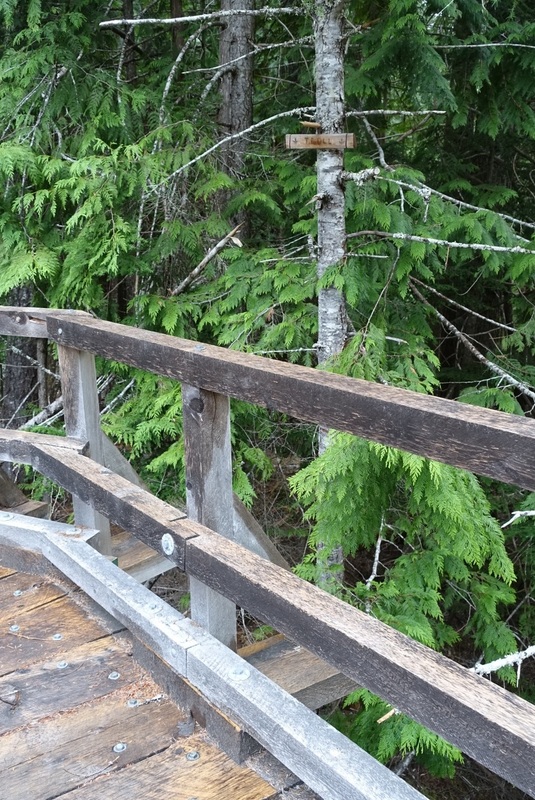 The trail took us through dense forest for miles as we descended to where Miners Creek joins the huge Suiattle River, then walked several miles along the north shore of the milky green Suiattle. We were elated to find the entire trail recently logged out, and even ran across the PCTA-affiliated volunteer trail crew who were just heading out after a week of work with crosscut saws (no chainsaws permitted in the wilderness area). We gave them a huge thanks, and let them know how much we appreciated their handiwork. We reached the huge, new (circa 2011) Suiattle River bridge just in time for elevenses, which we enjoyed under the bridge where the troll apparently hangs out. As we sat there, we started to see bits of sun peeking through the clouds. Perhaps we'll have a few dry days... but I won't hold my breath.